After exploring the music cloud and all but snuffing out any importance MySpace still holds, Steve Jobs and his little company known as Apple are nearing the end of their next campaign to conquer the music world: the master of the iPhone has at last brought The Beatles’ back catalog to digital music venue iTunes. For those wondering why this is a big deal given that anyone who wants The Beatles’ on their iTunes likely already does, here are a couple reasons. First, it marks the first time the iconic outfit’s music is available through any digitial platform. Though it is not yet known whether Apple will retain exclusivity over the music, iTunes is already selling full Beatles albums for $12.99, and individual tracks are available for $1.29 each. 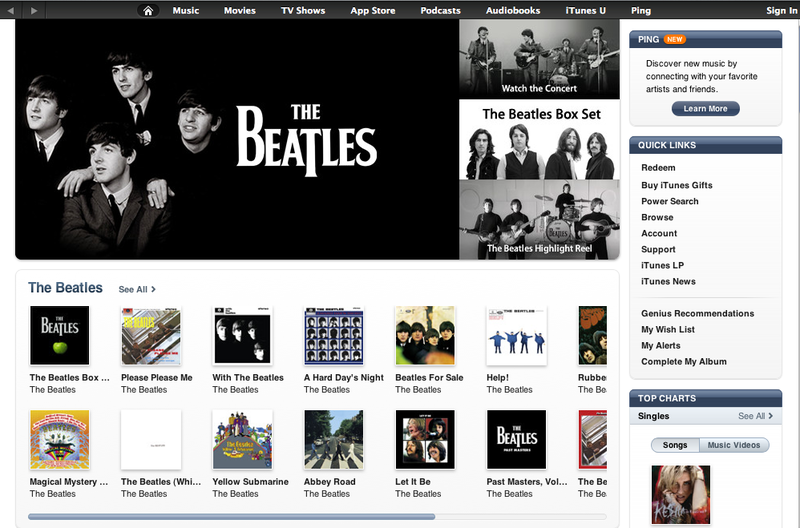 The entire Beatles box set can also be purchased for $149. The deal also ends the long-standing feud between Apple and The Beatles’ Apple Corps Ltd., which began when the latter sued the young computer up-start for trademark infringement in 1978 and has since progressed in recent years due the two sides’ inability to come to an agreement over digital distribution of the band’s music. We’ll update this post when details of the deal are disclosed. In the meantime, can Steve Jobs now conquer the mystery of the missing wardrobe?